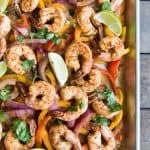 Sheet Pan Shrimp Fajitas is a 30 minute meal recipe that is perfect for busy nights when you don't have a lot of time for cooking or clean up, since the whole dinner cooks on one sheet pan! Your whole family is going to love this weeknight seafood dinner option that is packed with flavor. And you are going to love how easy they are to make! Heat the oven to 450 degrees. Place the shrimp and the veggies in two large, separate ziploc bags. In a medium bowl, combine the olive oil and all of the spices and stir well. Divide the spice mixture between the two bags with 3/4 of the oil-spice mixture going in with the shrimp and the remaining 1/4 going in with the veggies, then toss well to coat. Spread the peppers and onion on a large baking sheet in a single layer, then bake for 10 minutes while the shrimp marinates. Once the vegetables are just starting to get tender, pull them out and give them a quick stir, then add the shrimp on top of the veggies and return the pan to the oven. Bake for 6-8 minutes more, until the shrimp are pink and almost cooked through. Turn the oven to broil and cook the shrimp and veggies for another 2 minutes, until the shrimp is cooked through and the shrimp and veggies are just beginning to char a bit. Remove from oven and immediately drizzle with the melted butter butter and lime juice, sprinkle with chopped cilantro, and then serve with warm tortillas, sliced avocados, and cheese.